Among chanoyu utensils there are ones called 'meibutsu'. As for the word 'meibutsu', 'from long ago there have been famous utensils that have been given a mei (poetic name) because they were highly valued'. Of course they had value as utensils, but they were called meibutsu to distinguish them as utensils that had special owners or lineages. 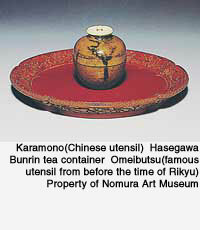 In the history of chanoyu the word 'meibutsu' can also be seen in the 'meibutsu-gari' (policy of collecting famous tea utensils) of Oda Nobunaga, for example. In the Edo period interest in utensils increased among tea practitioners, and the word 'meibutsu' began to be used as they wanted to evaluate and classify the ones the famous ones that had been handed down. Generally, 'meibutsu' are divided into 'o-meibutsu' and 'chuko-meibutsu'. This standard came from the 'Kokon meibutsu ruiju' (Classification of old and new meibutsu) produced by Matsudaira Fumai, a daimyo tea practitioner of the Edo period, with the aim of putting the different kinds of meibutsu in order. Meibutsu from before Rikyu's time were called 'o-meibutsu', and ones judged to be meibutsu by the Edo period daimyo tea practitioner Kobori Enshu were called 'chuko-meibutsu'. Utensils given a name during Rikyu's time were called 'meibutsu', so they were divided into three categories, 'o-meibutsu, meibutsu, chuko-meibutsu'. There are also utensils classified by their ownership or lineage. Those which were handed down by the Matsudaira family who were lords of Izumo are called 'Unshu meibutsu'. Those handed down by Shokado Shojo who was the chief priest of Iwashimizu Hachiman Shrine are called 'Yawata meibutsu', and those handed down at Settsu Ishiyama Honganji temple are called 'Honganji meibutsu'. Anyhow, there are many kinds of meibutsu in the 'meibutsuki' records, many of which have been handed down. Although they are not called 'meibutsu', there are also 'Higashiyama gomotsu', which were owned by the Muromachi shogun family, and those owned by the Tokugawa shogun family are called 'Ryuei gomotsu'.